Just Jumping on the Cliff Lee bandwagon. Here are couple of photos from a Phils 8-1 victory over the Arizona Diamondbacks in late August. Like last night Lee was also spectacular that night. In both games he went the distance and he only allowed one unearned run. Of course back in August the game was against the struggling D-Backs, and not the AL Champion New York Yankees. Oh and since it was an NL only game that night Lee was able to toss in a couple of hits too. Click any of the Photos to enlarge. Hopefully I will have a good reason to post some pictures of another new Phillies Pitcher tomorrow. This photo likely looks familiar to all the Phungo Readers out there (and hello to both of you!!) because it is the one that I have edited up and used as an avatar. The picture was taken 1 year ago tomorrow following the conclusion of the 08 World Series. One year ago today, October 28th, was the waiting day. The Phils and Rays were tied 2-2 going into the bottom of the 6th inning - for nearly 48 hours. It was odd and surreal then and remains that way today. Prior to the 2008 Series I predicted the Phillies in 5 largely based on two non-baseball reasons 1) Dave over at Fielder's Choice had predicted the Rays in 4 - a critical error in his thinking was dismissing Phungo Favorite Jamie Moyer. and 2) I had tickets to game 5. This year my prediction is based on even less critical thinking. I am picking the Phils in 5 solely because that is the prediction I laid out last year and it worked - beyond that, Never bet against a streak. Everyone enjoy the series and may we see the Phanatic waving a Giant Red Banner on Monday Night! Pop Quiz: How many postseason plate appearances does Orlando Cabrera have? Would you believe 155? Cabrera won a World Series Ring as the starting shortstop for the 04 "Why Not Us" Bosox. Since 04 he has been to the playoffs every year except 2006. A few weeks back Cabrera hit a key go-ahead Homer in the 7th inning of the one game AL Central Division tie-breaker game. This helped the Twins defeat the Tigers and get into the 2009 Playoffs. Paul's Random Stuff is on a roll as he has picked the auto in both of the first two weeks of this years competition. Everybody will need to be on their toes as PRS has knocked out both autos pretty quickly. 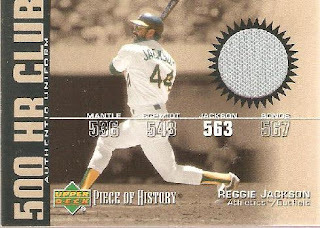 The Reggie Jackson Relic card may say Athletics on the front, but according to the reverse the jersey on the card is from the Angels. Congrats to Night Owl, Nachos Grande and Autograph Cards for all picking up the bonus. I have to give a nod to everybody who participated as all four of Reggies teams were picked - Including Beardy picking his hometown Orioles, with whom Jackson only played for a season. I am a fan of the Skybox Autographics Series - they are on card and the design works well for an autograph card. This particular card went for $2.11 (shipped) via auction. The cheapest recent ebay Orlando Cabrera auto went for $4.49 - Donruss Leather and Lumber sticker auto. There are several 98 Donruss Signature (on card) that have sold, but feedback scores for the sellers were mixed. Several Reggie Jackson Relics (Jerseys and Bats) have sold for between $4.23 and $8.50. The auctions generally don't specify what team the Uni Relics are from. The 02 UD Piece of History HR Club set featured 9 players, (Killebrew, Jimmy Foxx, Reggie, Mantle, Banks, Eddie Mathews, McGwire, McCovey, and Mel Ott). There were jersey cards produced for each player other than McGwire and Autograph versions for both Ernie Banks and Reggie Jackson. None of these relics have sold recently - there are a few BINs on eBay priced at $20 and up. Paul's Random Stuff - Mets: With a big David Wright RBI Double the PRS Mets are the first team on the board with one run. They also have men at 2nd and 3rd. Beardy and Adam welcome to the game and anyone else please feel free to join the game at anytime. For more Spot the Sig! details click here. And Remeber for the auto, only one guess per person. To get the STS! Bonus guess the team of the jersey swatch contained on this relic card. Each person only gets one guess, but a team can be picked multiple times by different contestants. A correct answer is worth a Walk for any and all correct entries. For more information on Spot the Sig! click Here. The competition is open to anyone, and you can join anytime - and A favorite team stack of junk wax awaits the winner!!! I have always been a big fan of Torii Hunter going back to his days with the Twins. He is a quality hitter with pop that plays the outfield well. I'll be rooting for the Earth Angels tonight to stretch out the ALCS to a 7th game. The truth is I would like to see the Phillies get the opportunity to play the Yankees. However, I am well aware there is a lot of upside for the Phillies if the Yankees cannot start Captain Cheeseburger in game 1. So for tonight Go Angels. The photo on the Phungo card is from a game at Citizen's Bank last year. Hunter's lone hit was a double off Adam Eaton during one of Eaton's many miserable starts. The Angels won the game 7-1 behind a 2-hit performance by the Ervin Santana and a pair of relievers. Also I wanted to remind folks to not forget that the 2nd Inning of the Spot the Sig! Contest will be happening tonight. I have a posting scheduled to go up by 9:30pm eastern. This is really late in blogosphere time, but as you are well aware the Philadelphia Phillies will get the chance to defend their World Series title either against the Earth Angels or New York Yankees. 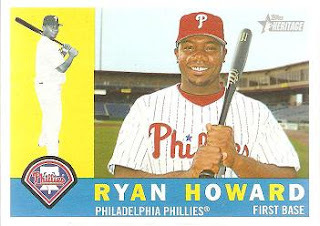 This years NLCS MVP was Ryan Howard who had a pair of homers. His average was "only" .333 but he had a bundle of walks and extra base hits which contributed to a lusty 1.457 OPS. I did notice another Sloppy Topps moment. I am sure there are bunches of these, and frankly I am surprised Topps even bothered to attempt duplicating the Season's Highlights section on the 1960 homage set. This is a minor error, and I would forgive Topps if this wasn't a star card of an MVP and reigning World Champion holding down a hero number (300) in arguably Topps most popular set. It was in GAME 4!!! Cograts to the Phils and bring on the Angels or Yankees! Congratulations to Paul over at Paul's Random Stuff for getting the first Sig of the Fall 2009 Tournament. Paul also picked Chase Utley for the bonus which was among the Players Team Phungo witnessed homer this season. PRS is off to a quick start with men on first and second - I will assume he is representing the Mets. The Utley Homer actually occurred against the Mets, in the first Phillies game I saw this year. This auto may have been worthy of more than a double - 1) it's a little sloppy and 2) part of it glances up off the sticker - but I balanced that with 1) Lee is a Phillie, although he is an Indian on this card - I figure most folks that check in here start thinking Phils right off the bat. 2) This was more major - The night of the contest Lee was on the mound in the middle of a pretty good game. The Cliff Lee Auto went for about $3.50 on ebay. It is a sticker auto, but the clear ones still look pretty decent. I picked this up prior to Lee coming over to the Phils, and at the time his autos were pretty reasonable for a guy coming off a Cy Young season. 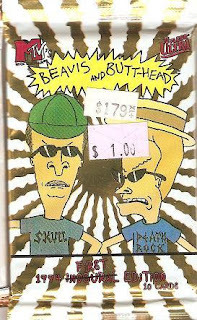 A more recent sale of this card went for $10.47. The low auction for a Cliff Lee certified card auto was $4.82 for the 05 Donruss Prime Patches card. 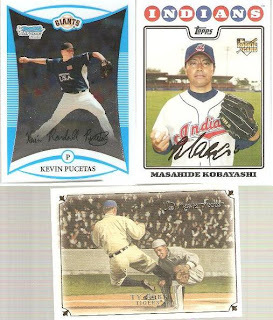 My favorites among the cards others that have sold on Ebay recently are the 07 Goudey ($7.94) and 07 UD Masterpieces ($10.01) - both are On-Card autos. His high Auto-Card was $50.00 for a 2002 Donruss Classics #d card - I assume this is a RC-Auto. Note: All prices above including shipping charges. I don't think I need to go into much here. Cliff Lee came over to the Phils to be there ace as they had many pitchers drop off during the season and Cole Hamels fell short of expectations. Lee has been formidable in his first post-season and I hope that continues. As I mentioned above he is a Cy Young award winner and he has been quite a workhorse the past two seasons. Spot the Sig! Standings - 1st Inning. Several folks collected bonuses so we are off to a quick start. Indians Baseball Cards Always - Indians: On Deck - David went with a long shot in Josh Beckett who did homer off the Phils but not in the game I attended. Thanks all for participating! The 2nd inning of Spot the Sig! will occur on Sunday Night, typically the Sigs go up around 9:30 PM. You can join the contest at anytime. We are off to a fast start with a lot of good competitors and I am sure everyone is looking forward to an exciting competition. For more information on Spot the Sig! click here. Today we here at Phungo will like to welcome everyone to the Fall 2009 edition of Spot the Sig! Team Phungo attended roughly 18 games so far during 2009 (Majors, Minors, Phils and other Teams) Name a player that hit a home Run during any of those games. For a look back at last years Spot the Sig! or for more background on how the Contest went last year click here. Team Phungo Puzzled - and less than 12 Hours till the debut of Fall 2009 Spot the Sig! 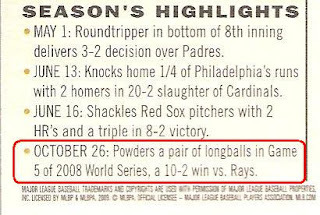 2009 10 17 - What was Team Phungo up to during a Phils off night and ALCS game 2? I don't know which was worse Brian Fuentes choking on an 0-2 Pitch to the best hitter in the American League, or placing 549 pieces of a puzzle only to find that Brad Lidge's nose is missing. but that is far to literary of an analysis for this sort of column. Moving on, Spot the Sig! for Fall 2009 will Debut during the 9PM hour (East Coast time) tonight Good Luck to all. The Phils are active tonight so, the post will be scheduled in advance, I will try and bop in and check the answers sometime during or after the game. Whats up with Team Phungo? I think you can tell what this is, but now your task is to figure out the subject. Less than 24 Hours Until STS! and what is going on at Phungo HQ? It has been a rainy cold miserable day and night here in the Philly-Burbs. So what do you suppose is going on in the Phungo Household?? Well we are watching the Yanks host the Earth Angels and prepping for the first inning of Spot the Sig! which is less than 24 hours away. Any Guesses on whats going on in the above photo? The Dodgers and Phillies are taking the day off today as their series moves to Philadelphia. This gives the staff here at Phungo Head Quarters a chance to catch our breaths and examine what is going on in the rest of the world - or at least elsewhere in Baseball. Yes in New York, there is another League Championship Series happening. The junior circuit series features a match-up between the New York Yankees and the Nomadic Angels. Well the Angels are really not nomadic, they just have no idea what city/town/province/locale they hail. To make it easy on them perhaps we should refer to them as the Earth Angels. This Bobby Abreu Phungo Card is a great way to rep this series. He is currently a member of the Earth Angels - see it's catching on - and he was also a Yankee. This photo was taken during a Yankees game on May 3 2008. Late in the game the Fanvision displayed portraits of the batters done by students from an area art school. I have no idea who the artist was that drew this picture of Bobby Abreu was nor the medium - pencil or charcoal maybe?? - perhaps this information was displayed elsewhere on another scoreboard. Perhaps the Yankees video staff thought it more important to display the Adidas logo on the video board. The Black Frames are the Phungo Card Inserts, and I looked for some oddball quirky shots for some of these. This is one of those oddballs. Bobby Abreu has been recognized at Dinged Corners recently and there have been various debates over his Hall of Fame Potential. Bad Wax ran a column on Abreu as part of the Definitive Collection Series. Abreu has always been a conundrum for me. I like what he brings to the table offensively. He hits well and has some pop, although much less than he did during his career peak with the Phillies. At age 35 he remains a good base stealer and is a plus on the base paths. And Offensively he knows how to work counts and draw walks. Among active players he is 7th all time in Bases on Balls. His .404 OBP ranks 8th. His .896 OPS ranks above Justin Morneau, Derek Jeter, and Carlos Beltran. But Abreu just never seem to come through in the clutch, granted while I was watching him he played many years with some terrible Philadelphia teams, the opportunities were scarce, when they came up many a pitcher would give Abreu a free pass and take their chances with someone like Travis Lee. In the field Bobby Abreu is basically adequate - he can cover some ground but does have that fear of the wall. He does have an above average arm and the Earth Angels consider him good enough to move the younger Vlad Guerrero to the DH Role. Personally, I am hoping that Abreu sticks around a few more years and gets 3000 Hits. He was one of the players that I always looked forward to seeing. 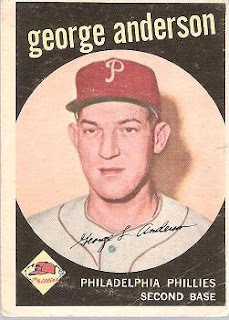 Yes, he was with the Phillies more marginal teams, and perhaps they needed to get rid of him to get over the playoff hump, but he was brought an awful lot to the table when he played here. This year the Dodgers and Phillies will meet for their 5th NLCS matchup. According to my hasty research this ties them with.....the Pirates and Reds as the most common NLCS opponents - go figure. 1977: The 2nd NLCS for each club. Don Sutton and Tommy John each toss 1 run complete games victories. Greg Luzinski muffs a critical play in the 9th innning of the pivotal third game. The Dodgers Win the Series 3-1. Dusty Baker (2 HR, 8 RBI, .357 BA) is named the first ever NLCS MVP. Mike Schmidt goes 1 for 16 (.067) in the series. 1978: The Phils lose the rematch 3-1. Steve Garvey hits 4 homers in the series and is named NLCS MVP. Dusty Baker has another good series batting .467 with a .556 OBP. The Dodgers pitchers hold Mike Schmidt to 3 of 15 at the plate with 1 RBI. For the second year in a row Bill Russell knocks in the go ahead run in the clinching game. Intresting Notes - Steve Carlton had a homer in the series and Steve Yeager who only had 14 career stolen bases, got one during the 1978 NLCS. 1983: We skip ahead a few years and the Phils turn the tables and win the series 3-1. Some of the players are the same as the Phils and Dodgers previous meetings, but there are some important new additions. The Dodgers feature there young Phenom Fernando Valenzuela while the Phils have added veteran Slugger Gary Matthews (featured top of the page and currently a Phils Broadcaster). MVP honors go to Matthews who bats .429, clobbers 3 Homers with 8 RBI. The 8 RBIs are enough to almost take care of the Dodgers singlehandedly as LA only scores 8 runs for the series. The Phils pitchers are led by Steve Carlton (2-0, 1 ER in 13.1 ip) as the staff holds the Dodgers to a .209 BA. 2008: I am sure that Last Year's series is still fresh in most folks memories. The Phils won the set 4-1 as Cole Hamels led them to victory in the first and last games. The performance earned the southpaw MVP honors. Shane Victorino and Pholk Hero Matt Stairs blasted game and series changing homers in the 8th inning of game four. 2008 is also the first time that the victor of the Dodgers Phils series has gone on to win the World Series. The 77 and 78 Dodgers lost to the Reggie Jackson era Yankees. The 83 Phillies Wheeze Kids squad lost to the Baltimore Orioles who featured a young Cal Ripken with only 345 major league games under his belt. Tomorrow Night the 2009 version of the rivalry will begin to unfold. Go Phightins!! At the 09 Trade Deadline the Phils and Indians worked a deal in which the Phillies sent Cleveland several prospects in exchange for Cliff Lee and Ben Francisco. Similarly Baseball Dad of All Tribe Baseball and I swapped a bunch of Indians and Phils baseball cards. BD was good enough to inspect my want lists and find about a half dozen cards which I needed. I forget - I may have only found 2 or three that he needed. Then we padded the trade with some miscellaneous Phils and Indians. I hope I was able come up with some card that fit into the All Tribe Baseball Collection, because BD came up with a great variety of Phils for me. This Cole Hamels Card is among the Phils Cards I received. 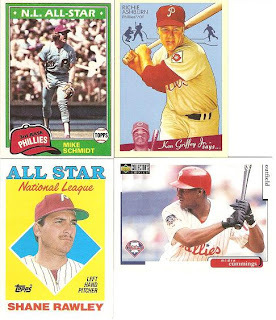 There was a real nice variety of cards which were perfect for beefing up the Phungo Phils collection. I have really enjoyed the Baseball Heroes Cards I have gotten in trades, because it is a set I ignored when it came out last year. The cards have a good look and since I am not building the set, the parallels add variety and don't bother me. My Pet Peeve on cards like this is always the lack of attention to detail. The card celebrates Hamels Major League debut, an 8-4 victory over the Cincinnati Reds. This is all great except the game was played in Cincinnati and this photo is of Hamels pitching at home in Citizen's Bank Ballpark. Here are some of the cards BD sent over to fill out my want lists. I am collecting the 08 Bowmand Draft Picks 66-110 as part of my Phungo Games Project. Kevin Pucetas is in the Giants organization. He skipped a level in 09 with mixed results, but that is a hitters league. And the Ty Cobb is one of four Masterpieces cards that were sent - With these four cards team Phungo is at the 3/4 pole for the 07 Masterpieces set. The Indians are coming off a tough season, but the Tribe faithful are very strong in the Card collecting business. I hope Baseball Dad is as happy with the Indian cards that I sent over his way as the ones I received today. Spot the Sig CONTEST Returns!!! Back by Popular Demand it is Spot the Sig! If you weren't around last year, Spot the Sig! was a Phungo contest which revolved around guessing the identity of an autograph posted on this blog. Like last year, each Sunday Night I will post an autograph and open the comments for guessing the identification of the signer. Each auto or Sig will be attached a base hit value (Single Double Triple Homer). The first person to Spot the Sig will get the hit applied to their team. The contest will run 9 weeks - I refer to each week as an inning - and the first inning will be next Sunday October 18th. Whoever has scored the most runs after 9 innings is the winner. The winner will be awarded a beautiful prize package consisting of a team bag of cards (likely crap from the late 80s + maybe a few nicer cards tossed in). I have heard that PTBNL will be back this season, however now he is going by PatSearcher. So warm up your Auto-Hunting thinking caps and we will look forward to seeing everyone next week - Generally I will attempt to get the postings up around 9:30-10:00 PM each Sunday. For a look back at last winter/springs first edition of Spot the Sig! check here and here. Phungo Joins "A Pack to be Named Later"
We are expanding our horizons over here at Phungo Headquarters. I have joined up with the rest of the good folks contributing to "A Pack to be Named Later"
The Phillies will later today embark on their first Post-Season of my lifetime without Harry Kalas along for the ride. As sad as this is to think about it is good to know that, after covering years of futility, Kalas did get to cover the Philllies 2008 World Series victory prior to his passing. The Phils will face off in the NLDS against the Colorado Rockies. The last game that Harry Kalas ever broadcast was on Easter Sunday, back in April, versus the Rockies. Last week NPR Sports Columnist and Commentator Frank Deford honored both Kalas and long time Detroit Tigers broadcaster Ernie Harwell during his Wednesday commentary. For the text and audio from his commentary click here. Five Below is a Philadelphia area chain of "upscale" dollar stores. As their name implies everything is $5 and under - actually most items are $5.30 including PA Sales Tax. They are good for stocking bricks of baseball cards in those clear plastic containers. The other things they have that may be of interest to a sports collector are baseball caps and other items of apparel with team logos. On a recent visit I noticed they had several New York Yankess McFarlane figurines running for $5. I don't really know anything about these things but $5 seemed reasonable for the right customer. If you are into higher end memorabillia I found it disturbing to find out that Darren Daulton is following in the footsteps of Lenny Dykstra and is selling off his 1997 World Series Ring (acquired with the Marlins). I have been prone to compulsive behavior myself but to any of us that would give up a limb just to be able to play professional sports at any level, the hocking of a World Series Ring at any price just sounds so ridiculous. Finally, There is one other special item for the right customer with an extra 40 thousand to throw around. Last year Cole Hamels was named the World Series MVP and won a brand new custom Camaro. Apparently the car that GM delivered was not what Hamels had ordered. Hamels is giving the car to his wife, Reality TV starlet Heidi Hamels, as a Birthday Present. Heidi correctly cited that the car is a sports car and should definitely have a manual transimission, unfortunately the car GM built was an Automatic. The erroneous Hamels car that GM had custom made was put up for sale locally and recently sold to a Philadelphia area buyer. For the Full details of the story click here. I just wanted to review the Phungo 5 scores from throughout the season. Thanks to everyone for participating. I hit up almost every team that the Phils played at least once, and hit some teams several teams (like the Braves). It was fun and informative - I plan on bringing the feature back next season. I thought about a playoff edition but it is looking busy here in Phungoville right now. Sadly several of these blogs have retired or gone on hiatus since their Phungo 5s ran. Hopefully new bloggers will step in to fill the vacated spots. Waxaholic - Braves 3/5 - I had two Qs for Waxaholic, he correctly guessed that Chipper would not homer but in a Hockey related Question Waxaholic picked the Caps to defeat the Penguins. Alas, Sidney Crosby and the Pens defeated the Capitals and eventually went on to win the Stanley Cup. Night Owl Cards - Dodgers 5/5 - I asked Greg to name some players of the game and blobs for the Series, he struck out on the tough blobs, but he nailed down Randy Wolf as one of his Player of the Game selections. Wolf pitched a quality start in the middle game of the series and earned a win for the Dodgers. A Cardboard Problem - Yankees - 5/5 - Sooz correctly surmised that the Phils and Yanks would go over the 10.5 Homers mark that I set as the combined barometer for the early season series. Sooz commented that I should give her the the over after game 1 in which the two teams combined for 7 dingers. Outside of one of the Camden Yards gates in there is an area where the Orioles have saluted their players with retired numbers. Each of the players is represented by a statue of their number. The photo above is of HOF 3rd Baseman Brooks Robinson's number 5. Recently Cal Ripken Jr's number 8 was stolen. The statue was quickly recovered. Cincinnati Reds Blogger Chris of Nachos Grande is doing his part to get the economy moving. He has started a Cards for Clunkers stimulus package. Simply put he has a few choice cards, that are Clunkers in his collection, and he is moving them out via trade for any cards that you have on his more recent Want lists. Chris had some great Phils Gold Parallels and I had some extra UD Masterpieces for trade. I sent out a couple of cards on Chris' Want List and a few other Reds cards, He was good enough to get me the Gold Cards, plus some Phils. I am not sure how many Schmidt Cards I have from the Topps Base issued during his playing days. Probably 1/3 to half of them. This 1981 Topps is new to my collection and I am glad to have the card. Another HOF card in the bounty was this sweet looking 08 Goudey Ashburn. Shane Rawley's only All-Star selection was for the 1986 game, in which he did not appear. This is a 1988 Topps card and the All-Star designation here is likely for the Topps team. Rawley was 2nd in the league with 17 victories during the 1987 season. 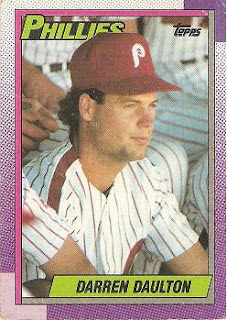 Midre Cummings only played for the Phils during the 2nd half of the 1997 season, and I doubt there were many cards issued of him as a Phile. He ended up the Phils principle center fielder during their miserable 1997 campaign. I have recently started a few player Collections, and Johnny Damon is one of the players I am collecting. The others are Garry Maddox, Jamie Moyer, Chase Utley, Bill Lee and Mike Mussina. I really don't have many Johnny Damon Cards and figured having a shiny X-fractor would be a nice anchor for one of the Damon pages. And a Special Thanks to Nachos Grande for including the Brad Lidge Sketch Card from the Gint-a-Cuffs Promotion. I hope that Nachos Grande is as happy with their new cards as team Phungo is with these fine selections. Both Sports Cards Info and Stale Gum have posted video on the Philly Show - both were entertaining and informative with some great cards. Here at Phungo we shall remain low tech and camera shy and bring you a show report with good old fashion scans. I had a great time at the show and the roughly 3 1/2 hours I alloted myself clearly was not enough. I spent almost my entire trip in the cheapo vintage bins. Pardon the presentation, I am lazy tonight and have left the cards in their sleeves. Better known as Sparky Anderson, And yes Sparky wore a Phillies uniform during his playing days. I spent more on other cards and may have found deeper bargains then this one, but this one was likely my purchase of the day. I believe there are only Two Topps Sparky Anderson cards the above 59 and his 1960 card #34. This card is in pretty good shape, though off-center and went for $2.50. Nice price for a rookie card of a Hall of Famer - albeit an HOF manager. The low completed auction on eBay for the 59 Sparky Anderson card ended at $6.64 (incl shipping) with many of the cards going for $10 and up topping out at just over $70. Frank Howard played before my time, but I saw him on the field several times as a coach and he certainly is a big man. There was no doubt that he looked like the type of guy that could hit 30 homers and 100 RBIs in a season. Nice RC to pull out of the dollar bin. I also came across several vintage Bowman cards in the dollar bin including this beat up Jackie Jensen card. If your not aware of who Jensen is, reach back into the baseball card blog annals to Ben Henry's post on 9 cards to Jump Start a collection and you will realize why you can't let this card go for a dollar. It should also be noted that Jensen made Jayson Stark of ESPN's all-underrated Red Sox top three strictly on the recommendation of Peter Gammons. A 75 Carlton Fisk might not be a steal for a buck, but look closer - this baby is a Mini. Can't turn down a 75 Topps Mini Hall of Famer. Just taking a break from all the vintage. This is the last card I needed to complete the Campaign 08 series. For this small set, I didn't care whether the card was a gold card or base. 1 of each candidate was enough for me. It is likely the weakest of the 08 Topps Insert sets, but it is the first I completed - whoohoo. This likely came out of the 3 for a dollar bin and I still payed to much for it. It was Sunday and check who we found in the half off bin - Two Vintage Hall of Famers and Jim Bouton. What the hell is a 2nd year card of Jim Bunning doing in the half off bin, and this is after already being knocked down to $6? 50+ Year old HOF card for three bucks - that's going in the Phungo collection baby. This is one of my favorite cards from my childhood and it was great to recover it and get the card back into a proper home witin my collection. The 1974 Topps Football is one of my favorites - The All-Pro cards don't have the goal posts but I really like the look of them. The ultimate David slays Goliath World Series. The New York Yankees outscored the Pittsburgh Pirates 55-27 in the 1960 World Series. But none of that mattered as the Bucos won the 4 tight games while losing the three blowouts. I look at this card and think of the Pirates winding down their umpteenth consecutive losing season, and the Bronx Bombers preparing to enter another Post-Season as the tournament top seed and favorite.....And then I think that if the Pirates could knock off the Yankees today, Now that would be David Taking Down Goliath. As you can tell I was mostly in the vintage bins. I can tell you that Chris over at Stale Gum was able to pick up a Hobby Box of Goodwin Champions for $68 (compare $82 Dave and Adam's Card World). I spoke with another colletor at the show that mentioned that the new Topps Ticket to Stardom was going for $75 ($85 DAC). The one item I passed on was a 1936 Diamond Stars #27 Pie Traynor. The card was slabbed in 1-Poor condition and ran $20. I considered it just to have a Hall Of Fame player out of this 70 year old set. Back in the 70s when Mike Schmidt and Brooks Robinson were still active Traynor was the Third Basemen on the Topps 1976 All-Time All-Star team. Now he is in danger of falling into the forgotten Hall of Famer category.